What “the jobs problem” is depends on how far into the future you’re looking. Near-term, macroeconomic policy should suffice to create enough jobs. But long-term, employing everyone may be unrealistic, and a basic income program might be necessary. That will be such a change in our social psychology that we need to start preparing for it now. Historical context. The first thing to recognize about unemployment is that it’s not a natural problem. Tribal hunter-gatherer cultures have no notion of it. No matter how tough survival might be during droughts or other hard times, nothing stops hunter-gatherers from continuing to hunt and gather. The tribe has a territory of field or forest or lake, and anyone can go to this commonly held territory to look for food. Unemployment begins when the common territory becomes private property. Then hunting turns into poaching, gathering becomes stealing, and people who are perfectly willing to hunt or fish or gather edible plants may be forbidden to do so. At that point, those who don’t own enough land to support themselves need jobs; in other words, they need arrangements that trade their labor to an owner in exchange for access to the owned resources. The quality of such a job might vary from outright slavery to Clayton Kershaw’s nine-figure contract to pitch for the Dodgers, but the structure is the same: Somebody else owns the productive enterprise, and non-owners needs to acquire the owner’s permission to participate in it. So even if unemployment is not an inevitable part of the human condition, it is as old as private property. Beggars — people who have neither land nor jobs — appear in the Bible and other ancient texts. But the nature of unemployment changed with Industrial Revolution. With the development and continuous improvement of machines powered by rivers or steam or electricity, jobs in various human trades began to vanish; you might learn a promising trade (like spinning or weaving) in your youth, only to see that trade become obsolete in your lifetime. In truth then, there is nothing more to wish for than that the king, remaining alone on the island, by constantly turning a crank, might produce, through automata, all the output of England. This possibility raises an obvious question: What, then, could the English people offer the king (or whichever oligarchy ended up owning the automata) in exchange for their livelihoods? Maslow. 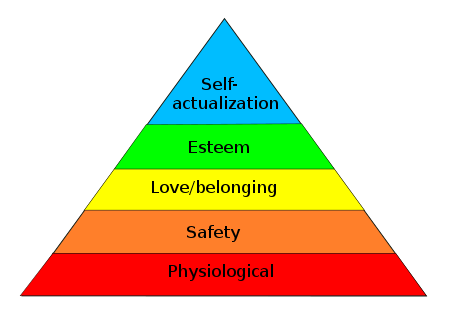 What has kept that dystopian scenario from becoming reality is, basically, Maslow’s hierarchy of needs. As basic food, clothing, and shelter become easier and easier to provide, people develop other desires that are less easy to satisfy. Wikipedia estimates that currently only 2% of American workers are employed in agriculture, compared to 50% in 1870 and probably over 90% in colonial times. But those displaced 48% or 88% are not idle. They install air conditioners, design computer games, perform plastic surgery, and provide many other products and services our ancestors never knew they could want. So although technology has continued to put people out of work — the railroads pushed out the stagecoach and steamboat operators, cars drastically lessened opportunities for stableboys and horse-breeders, and machines of all sorts displaced one set of skilled craftsmen after another — new professions have constantly emerged to take up the slack. The trade-off has never been one-for-one, and the new jobs have usually gone to different people than the ones whose trades became obsolete. But in the economy as a whole, the unemployment problem has mostly remained manageable. Three myths. We commonly tell three falsehoods about this march of technology: First, that the new technologies themselves directly create the new jobs. But to the extent they do, they don’t create nearly enough of them. For example, factories that manufacture combines and other agricultural machinery do employ some assembly-line workers, but not nearly as many people as worked in the fields in the pre-mechanized era. When the new jobs do arise, it is indirectly, through the general working of the economy satisfying new desires, which may have only a tangential relationship to the new technologies. The telephone puts messenger-boys out of business, and also enables the creation of jobs in pizza delivery. But messenger-boys don’t automatically get pizza-delivery jobs; they go into the general pool of the unemployed, and entrepreneurs who create new industries draw their workers from that pool. At times there may be a considerable lag between the old jobs going away and the new jobs appearing. Second, the new jobs haven’t always required more education and skill than the old ones. One of the key points of Harry Braverman’s 1974 classic Labor and Monopoly Capital: the degradation of work in the 20th century was that automation typically bifurcates the workforce into people who need to know a lot and people who need to know very little. Maybe building the first mechanized shoe factory required more knowledge and skill than a medieval cobbler had, but the operators of those machines needed considerably less knowledge and skill. The point of machinery was never just that it replaced human muscle-power with horsepower or waterpower or fossil fuels, but also that once the craftsman’s knowledge had been built into a machine, low-skill workers could replace high-skill workers. And finally, technological progress by itself doesn’t always lead to general prosperity. It increases productivity, but that’s not the same thing. A technologically advanced economy can produce goods with less labor, so one possible outcome is that it could produce more goods for everybody. But it could also produce the same goods with less labor, or even fewer goods with much less labor. In Sismondi’s Dystopia, for example, why won’t the king stop turning his crank as soon as he has all the goods he wants, and leave everyone else to starve? So whether a technological society is rich or not depends on social and political factors as much as economic ones. If a small number of people wind up owning the machines, patents, copyrights, and market platforms, the main thing technology will produce is massive inequality. What keeps that from happening is political change: progressive taxation, the social safety net, unions, shorter work-weeks, public education, minimum wages, and so on. The easiest way to grasp this reality is to read Dickens: In his day, London was the most technologically advanced city in the world, but because political change hadn’t caught up, it was a hellhole for a large chunk of its population. The fate of horses. Given the long history of technological unemployment, it’s tempting to see the current wave as just more of the same. Too bad for the stock brokers put out of work by automated internet stock-trading, but they’ll land somewhere. And if they don’t, they won’t wreck the economy any more than the obsolete clipper-ship captains did. But what’s different about rising technologies like robotics and artificial intelligence is that they don’t bifurcate the workforce any more: To a large extent, the unskilled labor just goes away. The shoe factory replaced cobblers with machine designers and assembly-line workers. But now picture an economy where you get new shoes by sending a scan of your feet to a web site which 3D-prints the shoes, packages them automatically, and then ships them to you via airborne drone or driverless delivery truck. There might be shoe designers or computer programmers back there someplace, but once the system is built, the amount of extra labor your order requires is zero. In A Farewell to Alms, Gregory Clark draws this ominous parallel: In 1901, the British economy required more than 3 million working horses. Those jobs are done by machines now, and the UK maintains a far smaller number of horses (about 800K) for almost entirely recreational purposes. There was always a wage at which all these horses could have remained employed. But that wage was so low that it did not pay for their feed. By now, there is literally nothing that three million British horses can do more economically than machines. Could the same thing happen to humans? Maybe it will be a very long time before an AI can write a more riveting novel than Stephen King, but how many of us still have a genuinely irreplacable talent? Currently, the U.S. economy has something like 150 million jobs for humans. What if, at some point in the not-so-distant future, there is literally nothing of economic value that 150 million people can do better than some automated system? Speed of adjustment. The counter-argument is subtle, but not without merit: You shouldn’t let your attention get transfixed by the new systems, because new systems never directly create as many jobs as they destroy. Most new jobs won’t come from maintaining 3D printers or manufacturing drones or programming driverless cars, they’ll come indirectly via Maslow’s hierarchy: People who get their old wants satisfied more easily will start to want new things, some of which will still require people. Properly managed, the economy can keep growing until all the people who need jobs have them. The problem with that argument is speed. If technology were just a one-time burst, then no matter how big the revolution was, eventually our desires would grow to absorb the new productivity. But technology is continually improving, and could even be accelerating. And even though we humans are a greedy lot, we’re also creatures of habit. If the iPhone 117 hits the market a week after I got my new iPhone 116, maybe I won’t learn to appreciate its new features until the iPhone 118, 119, and 120 are already obsolete. Or, to put the same idea in a historical context, what if technology had given us clipper ships on Monday, steamships on Tuesday, and 747s by Friday? Who would we have employed to do what? You could imagine, then, a future where we constantly do want new things that employ people in new ways, but still the economy’s ability to create jobs keeps falling farther behind. Since we’re only human, we won’t have time either to appreciate the new possibilities technology offers us, or to learn the new skills we need to find jobs in those new industries — at least not before they also become obsolete. Macroeconomics. Right now, though, we are still far from the situation where there’s nothing the unemployed could possibly do. Lots of things that need doing aren’t getting done, even as people who might do them are unemployed: Our roads and bridges are decaying. We need to prepare for climate change by insulating our buildings better and installing more solar panels. The electrical grid is vulnerable and doesn’t let us take advantage of the most efficient power-managing technologies. Addicts who want treatment aren’t getting it. Working parents need better daycare options. Students could benefit from more one-on-one or small-group attention from teachers. Hospital patients would like to see their nurses come around more often and respond to the call buttons more quickly. Many of our elderly are warehoused in inadequately staffed institutions. Some inadequate staffing we’ve just gotten used to: We expect long lines at the DMV, and that it might take a while to catch a waitress’ eye. In stores, it’s hard to get anybody to answer your questions. But that’s just life, we think. That combination of unmet needs and unemployed people isn’t a technological problem, it’s an economic problem. In other words, the problem is about money, not about what is or isn’t physically possible. Either the people with needs don’t have enough money to create effective demand in the market, or the workers who might satisfy the needs can’t afford the training they need, or the businessmen who might connect workers with consumers can’t raise the capital to get started. When society invents a new technology that makes workers more efficient, it has two options: It can employ the same number of workers and produce more goods and services, or it can employ fewer workers to produce the same number of goods and services. Jargon-filled media coverage makes this hard to see, but the Federal Reserve plays a central role in this decision. When the Fed pumps more money into the economy, people spend more and create more jobs. If the Fed fails to supply enough cash, then faster technological progress can lead to faster job losses — something we might be experiencing right now. So if you’re worried that technological progress will lead to mass unemployment — and especially if you think this process is already underway — you should be very interested in what the Federal Reserve does. Another option is for the government to directly subsidize the people whose needs would otherwise go unmet. That’s what the Affordable Care Act and Medicaid do: They subsidize healthcare for people who need it but otherwise couldn’t afford it, and so create jobs for doctors, nurses, and the people who manufacture drugs, devices, and the other stuff used in healthcare. Finally, the government can directly invest in industries that otherwise can’t raise capital. The best model here is the New Deal’s investment in the rural electric co-ops that brought electricity to sparsely populated areas. It’s also what happens when governments build roads or mass-transit systems. When you look at things this way, you realize that our recent job problems have as much to do with conservative macroeconomic policy as with technology. Since Reagan, we’ve been weakening all the political tools that distribute the benefits of productivity: progressive taxation, the social safety net, unions, shorter work-weeks, public education, the minimum wage. And the result has been exactly what we should have expected: For decades, increases in national wealth have gone almost entirely to owners rather than workers. In short, we’ve been moving back towards Dickensian London. The long-term jobs problem. But just because the Robot Apocalypse isn’t the sole source of our immediate unemployment problem, that doesn’t mean it’s not waiting in the middle-to-far future. Our children or grandchildren might well live in a world where the average person is economically superfluous, and only the rare genius has any marketable skills. The main thing to realize about this future is that its problems are more social and psychological than economic. If we can solve the economic problem of distributing all this machine-created wealth, we could be talking about the Garden of Eden, or various visions of hunter-gatherer Heaven. People could spend their lives pursuing pleasure and other forms of satisfaction, without needing to work. But if we don’t solve the distribution problem, we could wind up in Sismondi’s Dystopia, where it’s up to the owners of the automata whether the rest of us live or die. The solution to the economic problem is obvious: People need to receive some kind of basic income, whether their activities have any market value or not. The obvious question “Where will the money for this come from?” has an obvious answer “From the surplus productivity that makes their economic contribution unnecessary.” In the same way that we can feed everybody now (and export food) with only 2% of our population working in agriculture, across-the-board productivity could create enough wealth to support everyone at a decent level with only some small number of people working. But the social/psychological problem is harder. Kurt Vonnegut was already exploring this in his 1952 novel Player Piano. People don’t just get money from their work, they get their identities and senses of self-worth. For example, coal miners of that era may not have wanted to spend their days underground breathing coal dust and getting black lung disease, but many probably felt a sense of heroism in making these sacrifices to support their families and to give their children better opportunities. If they had suddenly all been replaced by machines and pensioned off, they could have achieved those same results with their pension money. But why, an ex-miner might wonder, should anyone love or appreciate him, rather than just his unearned money? This we commanded you, that if any would not work, neither should he eat. It’s worth noticing, though, that many people are already successfully dealing with this psycho-social problem. Scions of rich families only work if they want to, and many of them seem quite happy. Millions of Americans are pleasantly retired, living off a combination of savings and Social Security. Millions of others are students, who may be working quite hard, but at things that have no current economic value. Housespouses work, but not at jobs that pay wages. Countless people who have wage-paying jobs derive their identities from some other part of their lives: Whatever they might be doing for money, they see themselves as novelists, musicians, chess players, political activists, evangelists, long-distance runners, or bloggers. Giving them a work-free income would just enable them to do more of what they see as their calling. So far this argument is almost entirely speculative, with both sides arguing about what they imagine would happen based on their general ideas about human nature. However, we may get some experimental results before long. GiveDirectly is an upstart charity funded by Silicon Valley money, and it has tossed aside the old teach-a-man-to-fish model of third-world aid in favor of the direct approach: Poor people lack money, so give them money. It has a plan to provide a poverty-avoiding basic income — about $22 a month — for 12 years to everybody in 40 poor villages in Kenya. Another 80 villages will get a 2-year basic income. Will this liberate the recipients’ creativity? Or trap them in soul-destroying dependence and rob them of self esteem? My guess: a little bit of both, depending on who you look at. And both sides will feel vindicated by that outcome. We see that already in American programs like food stamps. For some conservatives, the fact that cheating exists at all invalidates the whole effort; that one guy laughing at us as he eats his subsidized lobster outweighs all the kids who now go to school with breakfast in their stomachs. Liberals may look at the same facts and come to the opposite conclusion: If I get to help some people who really need it, what does it matter if a few lazy lowlifes get a free ride? So I’ll bet some of the Kenyans will gamble away their money or use it to stay permanently stoned, while others will finally get a little breathing room, escape self-reinforcing poverty traps, and make something of their lives. Which outcome matters to you? Summing up. In the short run, there will be no Robot Apocalypse as long as we regain our understanding of macroeconomics. But we need to recognize that technological change combines badly with free-market dogma, leading to Dickensian London: Comparatively few people own the new technologies, so they capture the benefits while the rest of us lose our bargaining power as we become less and less necessary. However, we’re still at the point in history where most people’s efforts have genuine economic value, and many things that people could do still need doing. So by using macroeconomic tools like progressive taxation, public investment, and money creation, the economy can expand so that technological productivity leads to more goods and services for all, rather than a drastic loss of jobs and livelihoods for most while a few become wealthy on a previously unheard-of scale. At some point, though, we’re going to lose our competition with artificial intelligence and go the way of horses — at least economically. Maybe you believe that AIs will never be able to compete with your work as a psychotherapist, a minister, or a poet, but chess masters and truck drivers used to think that too. Sooner or later, it will happen. Adjusting to that new reality will require not just economic and political change, but social and psychological change as well. Somehow, we will need to make meaningful lives for ourselves in a work-free technological Garden of Eden. When I put it that way, it sounds easy, but when you picture it in detail, it’s not. We will all need to attach our self-respect and self-esteem to something other than pulling our weight economically. In the middle-term, there are things we can do to adjust: We should be on the lookout for other roles like student and retiree, that give people a socially acceptable story to tell about themselves even if they’re not earning a paycheck. Maybe the academic idea of a sabbatical needs to expand to the larger economy: Whatever you do, you should take a year or so off every decade. “I’m on sabbatical” might become a story more widely acceptable than “I’m unemployed.” College professors and ministers are expected to take sabbaticals; it’s the ones who don’t who have something to explain. Already-existing trends that lower the workforce, like retraining mid-career or retiring early, need to be celebrated rather than worried about. In the long run the workforce is going to go down; that can be either a source of suffering or a cause for rejoicing, depending on how we construct it. Most of all, we need to re-examine the stereotypes we attach to the unemployed: They are lazy, undeserving, and useless. These stereotypes become self-fulfilling prophecies: If no one is willing to pay me, why shouldn’t I be useless? Social roles are what we make them. The Bible does not report Adam and Eve feeling useless and purposeless in the Garden of Eden, and I suspect hunter-gatherer tribes that happened onto lands of plentiful game and endless forest handled that bounty relatively well. We could to the same. Or not. It would be interesting for you to read the “Culture” novels from Iain M. Banks: They are set in a non-scarcity future where no one has to work, but it doesn’t focus on it. You just get to see how people live in it. Frederik Pohl’s collection of short stories, “Midas World” takes place in a dystopian future where robotic production is so prolific, that the poor are obligated to consume at a frantic pace, and only the rich have the luxury of living lives of simplicity. Ooh, there was a guy who got a Nobel Prize for implementing a program that made microloans to people in small villages in third world countries–I learned about him and his program because he was interviewed by John Stewart on the Daily Show, so it was some years ago. He said he found that over 80% of the men they loaned to used the money to buy prostitutes, tobacco and liquor for themselves and their friends, essentially becoming the top dog or “headman” for as long as the money lasted, then they’d shrug their shoulders and indicate their empty pockets when it came time to pay the loan back. The women they made microloans to had a 98% payback and the only reason they didn’t pay back those 2% times were due to illness, death, or natural disaster. The women tended to invest the microloan in businesses that improved the lives of their children and village. So after that initial experiment, where they lost a ton of money because they mostly made microloans to men who didn’t pay them back, they reverted to mostly making microloans to women, and the program has prospered. It would be interesting to see if it shakes out similarly in Kenya: will the women invest in improving the lives of their children and village? Will the men use the opportunity of free wages to sit around boozing and smoking? What I have often worried about is a bifurcation which I see happening now and has been going on since well before Reagan. It really has little or nothing to do with automation, but rather the departure from agriculture and manufacturing to the “knowledge” economy, where one works in an office, hospital, or lab rather than farm or factory. What happens to the people who are just unequipped to do these jobs, which require more training than manual work? The notion of a basic income provision is about the least bad solution to this problem. But it won’t get anyone an office job other than receptionist or janitor. There will be a major split among workers which will require some cultural shift. The 2016 election was the first major earthquake in this shift, about which more some other time. The main issue is not that. Its that “knowledge jobs” are, much moreso than “labor jobs”, jobs that make up fixed costs rather than marginal. The knowledge jobs that aren’t are easily done by robots. It only takes one band to make the album of the year. It takes one architect to design the next scale-able building design. Besides things like basic research, physical art, and edification projects, there isn’t actually all that much “knowledge” work that scales that well either. You make one and then robots/computers reproduce it. I’m in favor of reducing the number of hours worked per week. If a “normal” “full-time” job had 30 or even 20 hours in it, more people would be able to have jobs, yet have leisure time as well. They could have the social success of having a job, but have time to learn something new, take care of their kids, do their art, exercise, sleep, and so on. I realize that some people would take two or three jobs, but this would help with the problem of unemployed people feeling that they have lost their identities/dignity, while also helping people lead sane and meaningful lives. The French tried this; it didn’t work. It’s based on the “lump of labor” postulate, that there’s a fixed amount of labor to go around. Unfortunately, this is false. First off the French did not try this first. It was the United States who pioneered the weekend and 40 hour work week. And that worked pretty damned well. Second off its not clear (well at least i haven’t seen any research on the subject) there is any suggestions that would lay the problems with the French economy at the feet of their reduced work week. If you keep writing like this, I may have to start a fan club. I really appreciate your bringing such clarity to me on historical context of unemployment – which seems so obvious once you stated it. It just never occurred for me to think about it just that way – must have been too much Adam Smith and Marx in undergrad. OK, I’m not the fan club type, and I rarely get to UU anymore since a few ministerial shifts, But if you’re ever in Atlanta, I have a spare room and am up for decent wine or bourbon and late night discussion. Bring Deb, unless she’s heard enough already. Doug, you touched on this but I wanted to make it more explicit. There are plenty of jobs for people to do that would greatly benefit society, but where no single person or company can make a profit from them because of the nature of the work. This ranges from basic research scientists to treating people with mental health problems. This implies that an important part of the solution will be government investment in these areas that end up employing more people. Alternatively, there could be government funding of institutions to do this work.Either way, the end result is that government should play a bigger role in the economy over time, not a smaller on. That’s a big cultural change we need to make. Another interesting piece of data that shows technology has definitely reduced the number of available jobs (and the need for certain jobs) – there is no more child labor in developed countries. Since this has been true for most of our lives we tend to forget that child participation in production / gathering was the norm for the vast history of the human race. It’s not needed, or considered desirable anymore. Excellent article. I mean first rate. Thank you. But I am compelled to point out that since I hadn’t seen anything by you prior to this, the misspelling in the last sentence of the second paragraph made me pause and wonder if I should continue reading. I am a horrible typist and speller myself, so this temporary but significant bump in the road surprised me. I am very glad I continued to the end (and encountered another misspelling and a typo). Two other aspects come into play, too, I think – at least in the relatively near future. One aspect is the disruptive technology called The Cloud. Some commentators believe that Trump’s insistence on bullying companies over outsourcing will expedite their transition of much of their IT-related activity into the Cloud, and through that into employing individuals overseas (micro-employing, most likely – taking on contractors for a few hours at a time) so that US-based businesses will become more like shells operated by at most one or two layers of upper management. Few if any Americans would be employed in the lower echelons, IMHO. Such companies might have a very short lifespan, being brought into existence for as long as necessary, by entrepreneurial types who spot an opportunity and leap into the fray. It would be important to make sure that the State accrued revenue from taxation of profit from those enterprises, and perhaps even vital that individuals engaged in such activity should see themselves as socially responsible – contributing positively to the good of society at large – and not tainted with the selfish tax-evading mindset that is the hallmark of many (not all) “big” entrepreneurs today. The other aspect is the rapid progress towards spacefaring – by which I mean both the possible colonization of other, local, worlds – Mars and the Moon are two prime candidates, obviously – and the employment of both humans and machines in the areas of asteroid mining and even off-world hotel accommodation for example, two industries that are already gearing up for the near future. That direction may afford an opportunity for those who do not feel disposed to create a sense of self-worth here on Earth by being paid an income that permits a reasonable standard of living and yet also affords the opportunity to add to that income in various ways, but would prefer to pit themselves against the elements in much the same way as explorers and seafarers did in our historical past. As always, it’s a question of convergence and how that is managed. I don’t see Trump and the GOP being remotely prepared for the future – theirs is a mindset obsessed with a mythical golden age from the past. Will progressive Democrats or others step up to the plate, I wonder? you’re first note about micro contracts, short term companies, and offshoring is 100% happening already and will continue to happen. i work in software and many folks i know (myself included) would be considered part of the growing gig economy. most of us consider full time employment the same way anyway. everything moves too fast in this industry to consider long term employment as low risk. However, true micro-contracting (working for a handful of hours for one employer as a one-off, and for a level of payment that would have been unthinkably low even a few years ago – I’m talking $2 an hour in some cases, $10 if you’re lucky) is a relatively new phenomenon and has yet to pick up among the professionally qualified. eLance is a prime example of the kind of thing I mean. The creation and dissolution of businesses with a timeframe of a matter of weeks if not days is something that probably only exists in a scammer’s world now, but will almost certainly move into the mainstream over the next 5-10 years. Offshoring as it exists now is conducted by fairly sizeable business entities – a major company in the US contracting out its customer service or software development to one or a handful of agencies in say India – but the microcontracting employment will probably be between temporary sole proprietors in the US and overseas brokers who have strings of self-employed contractors working online from home (in places like Darfur, for example). I haven’t seen that being reported as a mainstream activity yet. i think part of the “depends on how far into the future you’re looking” issue has a lot to do with generational gap. my fellow millenials don’t have habits and products and means of communicating that last longer than a few years. we have a longer runway to stare down (especially when you talk about our kids or future grandkids) and a viscerally different perspective on the pace of change. things like automation or climate change are very tangible realities we consider in our risk analysis for the future. maybe i’m skewed a bit since i work in software where you can be an expert after working on something for 3 years because it’s only been here that long. almost nothing i work on now existed when i graduated college. means but not the will to overcome it. while it is (in my terms) potentially anti-economic. this shift is (in my terms) anti-economic. The real obstacle to a guaranteed minimum income will be the conservative ethic that says no one should be paid for not working. The exceptions to this have an excuse – the disabled can’t work, the retired are living off what they earned when they were working, students are supported by their parents or, if they borrow to finance their education, they’re living off their future earnings, and trust fund beneficiaries live off their inheritance. And the unemployed are only supposed to be on the dole for a short time until they find a new job. Conservatives don’t really have a problem with these, but a guaranteed income is going to sound like paying people to do nothing, and if the only way to pay for this is to print more money or raise taxes on the 1/10 of 1% who have benefitted most from the current system, there’s going to be serious opposition based not on rational critique, but on a visceral reaction to wealth redistribution. There is a third opportunity for tax revenue – the small businesses that form the bulk of entrepreneurial enterprise today and which will probably (IMHO) continue to do so. The chances are that large numbers of people who benefit from having a permanent safety net to underpin their aspirations will launch all sorts of ways of generating additional income that could develop into cottage industries, some of which might be impossible to imagine at this point in time. You didn’t mention an obvious problem. We are over-populated. Whether because of religious edict, cultural norms, or sheer lack of foresight, our numbers are still growing too rapidly for the number of future jobs. We already have too many people for the limited amount of resources–food, water, clean air. I see countless articles about “How will we feed the millions of people who will be born in the next 50 years?” The real question should be: Why don’t we spend some money on education and birth control before we start to look like India? Having more babies than you can personally feed and educate without government assistance should be discouraged, either by TV ads, billboards, or public shaming. You’re correct in that the limitation on population depends on available resources, however, technology also plays a role by increasing efficiency – with the same resources, we can be more productive. We will be able to feed more people because we will grow more food on the same amount of land. And as the population increases, the jobs required to service that population will also increase. I completely agree that people should be discouraged from having more children than they can care for, however, “government assistance” is not just charity; it also includes benefits such as free public education. If you’re going to tell me that people shouldn’t have children unless they can afford to send them to private school, I would have to disagree. Some government programs are beneficial to society as a whole. Just as a side note, the other day I happened to talk with a guy who works in the Amazon Fulfillment warehouse. He was pretty emphatic that drone shipping is not going to happen. Anyway, for now. Doug Muder at The Weekly Sift wrote a year ago about jobs and the economy, reviewing historical trends and how conservative macroeconomics has affected America. Trickle-down economics doesn’t work. The owners, i.e. the wealthy, do not use their money to create jobs. They use their money to obtain more money. When I was creating the America in 2048 that Evan Quinn leaves in Perceval’s Secret, I was thinking about what I observed happening in American society, i.e. the rich were getting richer and the poor poorer, and there was a new class of working poor that did the work for the wealthy. This is now a reality in 2018 America. In the Perceval’s Secret America, the wealthy also have the political power (think Donald Trump) to rule the country as they wish and prevent any change. America had become a “Potemkin Democracy,” i.e. appeared to be democratic but was actually a fascist dictatorship. I like this post from The Weekly Sift because Muder goes into detail and explains with examples the process.